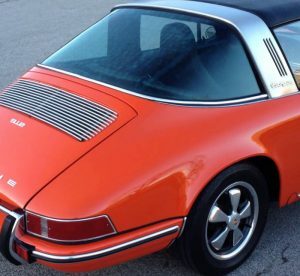 Trade Classics > 1960s Classic Cars > Is the Porsche 912 Set to Pick Up the Investment Baton From the 911 in 2018? Is the Porsche 912 Set to Pick Up the Investment Baton From the 911 in 2018? So we’ve reported over the last few months a slight slowdown in the 911 market. We speak to many people in the trade and they are saying the same thing. However, lower value 911s like the 3.2 Carrera we auctioned last week will always be desirable at sensible money in the £30k-£40k range, as they are more obtainable and still a ‘proper’ air-cooled 911. The market at the other end of the spectrum, i.e. the rare and super desirable 911s is still very healthy and shows little sign of reducing. Just last weekend, RM Sotherby’s sold a 1993 RSR 3.8 for $1.27m; yes that’s right, ONE POINT TWO SEVEN MILLION DOLLARS. It’s the middle of the market that we’re seeing a slowdown, i.e. the £60k to £90k bracket. Top end models like the Carrera 3.2 Coupé and 930 Turbos are taking longer to sell and we’re seeing a slight reduction in pricing. The cars that once had £80k – £90k price tags are on the market for longer and traders seem keen to make deals to move them on. But all isn’t lost for the Porsche investor, there’s a little gem right now that’s doing really well and managing to keep a very low profile. Enter the Porsche 912 with its a superb little flat four revvy engine. Let’s look at the stats, only 32,000 were made in just 5 years (1964 to 1969), so when you compare that against 443,00 air-cooled 911s produced from 1963 to 1997, then you’re actually buying something a little bit rarer; 92.8% rarer in fact! And as we all know, rarity is an important part of the investment calculation. Ready to get even rarer? Well consider a Targa version of the 912 as only just over 2,500 of those were made (8% of the total 912 production), and don’t forget, since the stunning 991 Targa was launched a few years ago this has had a positive increase on early versions that were once unloved by many. But aren’t these little four cylinder cars just for people that can’t afford a 911? Well quite simply no, of course that’s what some people used to say back in the day. However, today these cars are being judged properly on their merits. They share the same bodyshell and chassis as the 911, but with the smaller flat four engine they demonstrated better weight distribution, handling and of course could go further due to increased MPG. It’s obvious then when you look at it and smart investors have already realised the car’s potential and prices have been on the move. We have a few 912s coming to auction in the next few weeks and excited to see what money they achieve. The first one will be on auction in a couple of weeks – see here. In conclusion, it looks like an early long hood 911 (because it has the same body), it handles better (arguably) than an early 911 (more balanced weight distribution), it’s rarer than an early 911 and oh yeah, it’s much cheaper than an early 911 (much much much cheaper in fact). Adam is CEO of Trade Classics and passionate about two things; digital technology and classic cars. They say do what you’re passionate about the rest will follow, so back in 2011 Adam set up Trade Classics as a new digital platform to publish classic car articles and classified vehicle sales for free.